O God, for whose honor the Bishop Saint Stanislaus fell beneath the swords of his persecutors, grant we pray, that we may persevere strong in faith even until death. Through our Lord Jesus Christ, your Son, who lives and reigns with you in the unity of the Holy Spirit, one God, for ever and ever. According to the 1962 Missal of St. John XXIII the Extraordinary Form of the Roman Rite, May 7, is the feast of St. Stanislaus. In Poland his feast is celebrated on May 8, which is the day he died. 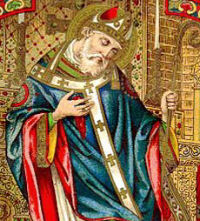 Also the feast of St. Leo the Great is today and in the Ordinary Form his memorial is celebrated on November 10.